The Jigsaw ransomware is back again with a fresh variant. The theme of this variant is the Invisible Empire art exhibit made by Juha Arvid Helminen. The ransomware is called Invisible Empire and named after the exhibition. This crypto-virus encrypts files with more than 120 extensions as its past variants, adding a .payransom extension. To know how to restore your files and remove the ransomware, you should read the article in full. Short Description The ransomware encrypts files by adding a .payransom extension and asks a ransom for decryption. Symptoms Files with more than 120 different extensions are encrypted. A Invisible Empire themed lock screen with instructions for paying is displayed. Every hour files are erased if the ransom money is not paid. User Experience Join Our Forum to Discuss Invisible Empire. Invisible Empire Ransomware – How Does It Spread? Multiple ways exist that spread the Invisible Empire ransomware. You might get infected with it through spam e-mails containing an attachment with a malicious code inside. If such an attachment is opened, the malware could be injected inside your machine. The file probably has a name like firefox.exe or of something popular and useful so it can trick you. Previous variants of the now called Invisible Empire ransomware were spread via social media networks and file-sharing systems as well. DropBox is still not an excluded way of distribution – it might be still in play. You should avoid all suspicious files, websites, and links as they could very well be just another method of infecting you with the malware. The Invisible Empire crypto-virus is also classified as ransomware. It will encrypt all your files, and they will become simply unusable. The virus demands BitCoins as payment for the ransom. If you do not meet the required criteria, your files will be deleted on an hourly basis. The ransomware is a clone of other ransomware. 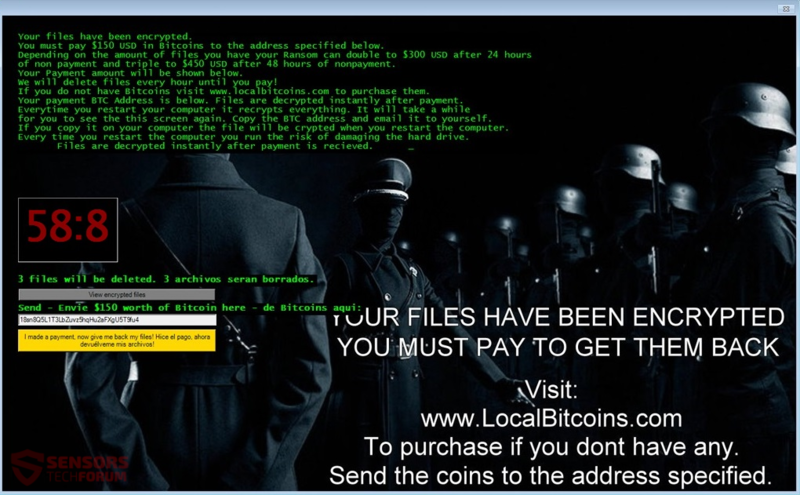 Its previous variants are the Jigsaw ransomware and CryptoHitman ransomware. Nor the Hitman character nor the ‘Saw’ puppet is used as a theme for the ransomware – this time, it is a popular art exhibit. The registry value, which is set makes the file wrkms.exe to automatically start. Every loading of the Windows Operating System will launch the file executing the Invisible Empire ransomware. What follows is, that the ransomware will display a lock screen themed after an art exhibit of the same name done by Juha Arvid Helminen. The theme of the exhibition is to show how law enforcement officers can hide behind their uniforms and commit crimes. The ransomware bears the name of this exhibit and to be more precise – Invisible Empire. You are demanded to pay 150 US dollars, in BitCoins, within the hour. If you do not comply, the ransomware claims that with each passing hour, encrypted files will get removed from your drives and eventually you will lose all of your files. The sum doubles if you don’t pay within 24 hours and triples if the payment is not complete in 48 hours. If you do not have Bitcoins visit www.localbitcoins.com to purchase them. Your payment BTC Address is below. Files are decrypted instantly after payment. for you to see the this screen again. Copy the BTC address and email it to yourself. If you copy it on your computer the file will be crypted when you restart the computer. Every time you restart the computer you run the risk of damaging the hard drive. Files are decrypted instantly after payment is received. 3 files will be deleted. 3 archivos seran borrados. To purchase if you dont have any. Send the coins to the address specified. To pay the ransom of the Invisible Empire ransomware goes unadvised. You cannot have any guarantee from anybody that you will get your files back and if they will work. Spending money to support cyber criminals can only fuel them with inspiration and capital to commit more crimes or enhance the ransomware they have. Take note, that at the end of this article, some restoration methods are described, and you can also read about a decryptor. The AES algorithm is still used for the encryption process of this Jigsaw ransomware clone. This variant of the ransomware puts .payransom as the extension of the encrypted files. If you restart your machine, there is a possibility that nearly 1,000 out of all encrypted files might get wiped from your disc drives. As the core of the ransomware hasn’t changed, there is still a solution to restore your files. In case you already restarted your computer after the encryption process was complete and lost some files – don’t worry. Data Recovery tools can help you recover part of the files. If Invisible Empire ransomware infected your computer, don’t you worry, because a solution for free decryption of the files exists. If you got infected by the ransomware, you should have at least a little experience in removing viruses. See the instructions written down below to see how to recover your files. Threats such as Invisible Empire may be persistent. They tend to re-appear if not fully deleted. A malware removal tool like Combo Cleaner will help you to remove malicious programs, saving you the time and the struggle of tracking down numerous malicious files. Threats such as Invisible Empire may be persistent on your system. They tend to re-appear if not fully deleted. A malware removal tool like SpyHunter will help you to remove malicious programs, saving you the time and the struggle of tracking down numerous malicious files. Note! Your computer system may be affected by Invisible Empire and other threats. SpyHunter is a powerful malware removal tool designed to help users with in-depth system security analysis, detection and removal of threats such as Invisible Empire. 1. Install SpyHunter to scan for Invisible Empire and remove them. 2. Scan with SpyHunter, Detect and Remove Invisible Empire. Ransomware infections and Invisible Empire aim to encrypt your files using an encryption algorithm which may be very difficult to decrypt. This is why we have suggested several alternative methods that may help you go around direct decryption and try to restore your files. Bear in mind that these methods may not be 100% effective but may also help you a little or a lot in different situations. Note! Your computer system may be affected by Invisible Empire or other threats. Remove Invisible Empire by cleaning your Browser and Registry. Fix registry entries created by Invisible Empire on your PC. Combo Cleaner is a powerful malware removal tool designed to help users with in-depth system security analysis, detection and removal of threats such as Invisible Empire. Step 5: In the Applications menu, look for any suspicious app or an app with a name, similar or identical to Invisible Empire. If you find it, right-click on the app and select “Move to Trash”. Step 6: Select Accounts, after which click on the Login Items preference. Your Mac will then show you a list of items that start automatically when you log in. Look for any suspicious apps identical or similar to Invisible Empire. Check the app you want to stop from running automatically and then select on the Minus (“–“) icon to hide it. Remove Invisible Empire – related extensions from your Mac’s browsers. A pop-up window will appear asking for confirmation to uninstall the extension. Select ‘Uninstall’ again, and the Invisible Empire will be removed. When you are facing problems on your Mac as a result of unwanted scripts and programs such as Invisible Empire, the recommended way of eliminating the threat is by using an anti-malware program. Combo Cleaner offers advanced security features along with other modules that will improve your Mac’s security and protect it in the future. Hey !, I found this information for you: "Remove Invisible Empire Ransomware and Restore .payransom Files". Here is the website link: https://sensorstechforum.com/remove-invisible-empire-ransomware-restore-payransom-files/. Thank you.